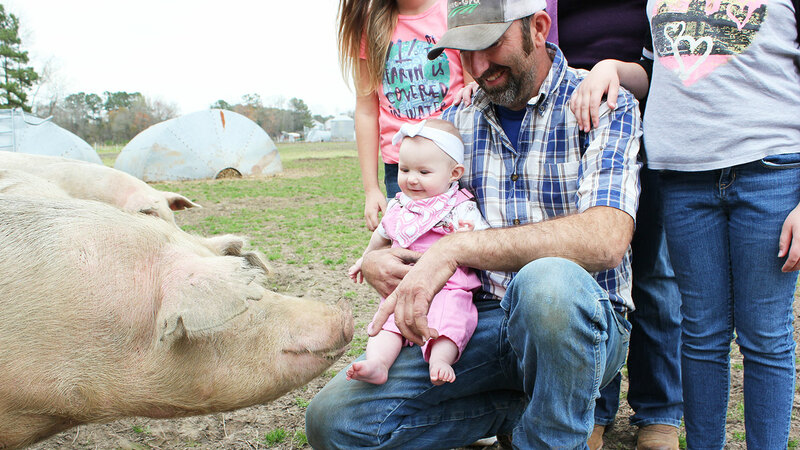 Jeremiah and Jessica Jones raise hogs and grow row crops on their family farm in Beulaville, North Carolina. Jeremiah Jones is one busy man. The Ag Institute grad — who earned five degrees in two years — raises Animal Welfare Approved free-range hogs; grows and processes his own feed; operates a non-GMO soybean processing facility for local farmers and is president of the North Carolina Natural Hog Growers Association. His efforts haven’t gone unnoticed. He was the 2010 Glynwood Harvest Award recipient and has received several other recognitions and grants from the Center for Environmental Farming Systems, Rural Advancement Foundation International, AWA/A Greener World, NC Choices and more. 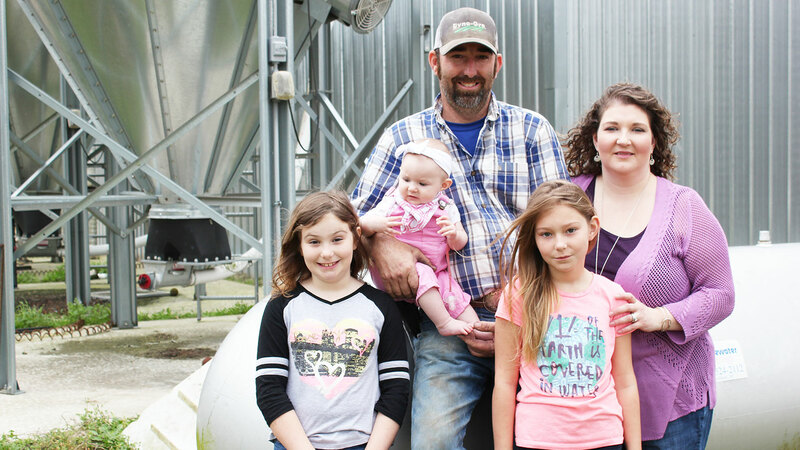 We caught up with Jeremiah and his wife Jessica (also a CALS grad) to learn more about their family farm, GrassRoots Pork Co., and why they love what they do. What does it mean to be Animal Welfare approved? It means that you use no antibiotics or growth hormones. It’s all-natural. You’re doing pasture rotation. You’re managing the land and taking care of the environment. Just to keep the land and the farm to where you can keep passing it on to generations and try to leave it in better shape than you found it. Tell us about your experience in the Ag Institute. I didn’t even want to go to college. I wanted to go right into farming. I decided on the Ag Institute so I could go real quick. And my first semester my adviser helped me get a bunch of scholarships and grants. And then he signed me up for work study at the dairy plant. 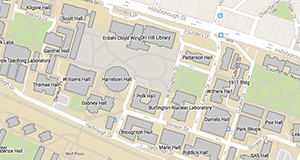 So I’d get up at 3:00 in the morning and go over to Schaub Hall and start work before class. I did that my first semester and took 18 hours of classes. And then after that, I started taking 22 to 26 credit hours a semester, and I finished in two-and-a-half years and got five degrees. I loved the Ag Institute. How did your AGI experience help prepare you for a career in farming? The farming classes, the agronomy stuff, I liked it because you’d have a class, but you wouldn’t have one set professor. So they’d bring in David Jordan for the peanut part. They’d bring in Jim Dunphy for soybeans. They’d bring in Ron Heiniger for the corn. So you were learning from the ones who were out there doing the research. That was the best part of it. 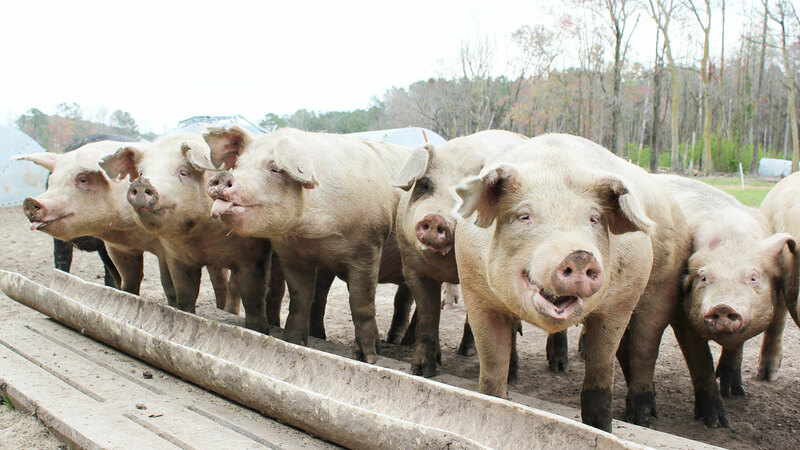 How did the North Carolina Natural Hog Growers Association get started? The co-op came out of necessity … I had just gotten into hogs and put myself in a bunch of debt. And then when you stay in the business with no market, you don’t know if you’re doing right or wrong. And every day you’re digging the hole deeper. So I went from September 13th of ’06 to January 30th of ’07 before I sold and got a premium. We had right much help from NC State, NC A&T and Extension. Then when we formed the co-op, we started selling to Whole Foods and then we never did any marketing. We never went out and sought markets. Once we started dealing with Whole Foods, then everybody kept coming to us. Now we sell to Firsthand Foods out of Durham and Chapel Hill. And we sell to Lady Edison Pork. They also own a restaurant in Chapel Hill, The Pig. How many farmers do you have right now? We have about 20. They’re located in Duplin, Sampson, Pender, Johnston and Stanly counties. And you’re the president and have been since the beginning? Yes. And Jessica’s done right much to help the co-op form. (Jessica) I did grant writing and invoicing at the beginning … a lot of paperwork and getting through red tape. I still do billing and invoicing for Jeremiah and handle emails. On top of having a full-time job and parenting three young children? (Jessica) Yes. I’m an environmental health specialist in Duplin County. But before that, I taught eighth-grade science in Onslow County. Jeremiah, what’s your role in the co-op? I do all the scheduling. So the buyers text me on Monday, and then I let the farmers know who’s going when and what dates they’re delivering and how many and whatnot. I do all the coordinating with the buyers and then we’ve started going and helping educate the buyers. NC Choices works closely with us. We’re the largest Animal Welfare approved pork co-op on the East Coast, I think. We own about 90 acres, and tend about 300. The land has been in my family since before the 1900s. We have 60 sows, and we farrow to finish everything. We raise all the grain here on the farm, mix all the feed on the farm. The only thing we bring in is the vitamins and minerals, premixed. Why do you choose to grow all your own feed? To me, you know what you’ve got quality-wise. You know where it comes from. And we test the seed even before we plant. We have to test every lot number of seed to prove it’s non-GMO. That way we know what we’re getting at the end. Is there such a thing as a typical day of farming? Not really. You don’t always do what you planned to do that day. I feed the hogs and check on them. Sometimes we’ve got to grind feed three or four times a week. And then, depending on the farmers’ beans here, I try and start it early while I’m tending the hogs and stay with it. I do all my own maintenance and mechanic work. I’m running people’s beans while I’m working on the tractors because you have to stay around the roaster when it’s running. But with the hogs on the ground, what people don’t realize is that it’s not mechanized. It’s not automated like hog houses. It’s a lot of physical labor. But I think you just, no matter what you do, you’ve got to have the drive to do it and succeed. (Jessica) We met at State. And he was actually about to graduate when we first started dating. He graduated in December of 2001. And I graduated May 2002. We just knew each other for a while. So we started dating in January of 2002, and he was moving back home. I was still in Raleigh finishing school. I have a bachelor’s in poultry science, and minors in animal science and agribusiness management. If everybody enjoyed what they do as much as I do, the country would be in a whole lot better place.